The value of pipe #279 is n/a points. Lee Pattison is a man I admire tremendously. He does not collect these pipes, but whenever he sees one, he gets it for me. He never wants me to pay for them, asking only "Send me some good tobacco." I try to give him the best I have cellared in sufficient quantity that he feels adequately compensated. 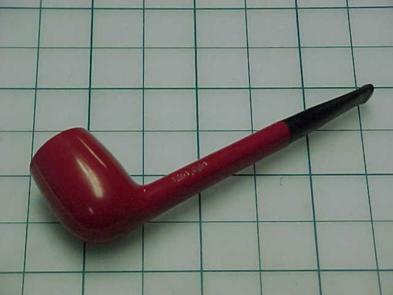 This pipe, along with the three other Venturi, Inc. pipes and several odd sorts of pipes he sent this time, make it difficult to match his generosity. The Federal Gold Bent has joined the collection; the other Venturi products went to the Pipes for Sale page; the odds and ends will be offered on eBay. Thanks, Lee! This red Canadian was bought by Brent Richards the day it was posted.